AMAZING STRAINING AND DRAINING: You can’t ask for a better food draining experience than the YBM Home Plastic Colander for your kitchen. Our colanders offer improved functionality. This will ensure you don’t slip and stay safe when straining out boiling water from your rice or pasta pots. SITS SECURELY ON YOUR POTS: Keep your hands free for any other tasks in your kitchen. Once you have finished straining. the top frame and handle allows you to place the quick drain colander on top of your pots, pans, mixing bowls or other food prep containers, so the rest of the liquid to drain away hands free. 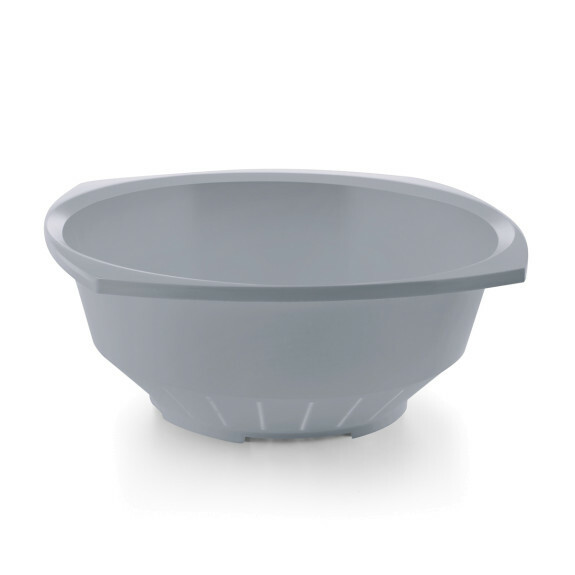 QUICK DRAIN DESIGN: This wide hole colander comes in both a square and circular design. The drainage holes are arranged in such a way that you can drain your pasta, veg or other foods in no time at all. The holes are perfect for rinsing herbs or vegetable as they allow dirt, sand or soil to drain away, leaving your leaves clean and fresh. EASY AND CONVENIENT STORAGE DESIGN: The design of this unique Colander for the kitchen can fit in the top rack of your dishwasher for easy and fast clean up time. They are also stackable so you can stack this spaghetti colander together with other pots in your kitchen drawers or cupboards. MADE OF FOOD SAFE BPA FREE PLASTIC: Stainless steel colanders may look modern, but they can get too hot, rusty and ruined. This plastic strainer uses nontoxic materials and is BPA free, with acidic and alkali stain-resistant materials. It will last you years of use without staining or showing signs of wear and tear. Serve your family hearty meals using YBM colanders. , Measurements: Upper Diameter with rim: 11 Inches, Bottom Diameter 6 Inches, Height: 4.5 Inches. This Model is Available in 4 Colors: Gray, Ivory, Red and White. HOW CAN YOU POSSIBLY COOK IF YOU DON'T HAVE AT LEAST ONE YBM HOME ROUND OR SQUARE COLANDER! The Easiest menu For Supper is PASTA of course. Then you just throw some sauce on it and viola you have a gourmet meal. If you don't have a colander or your colander broke, melted or your baby took it as their new toy, it's time for a new one. YBM HOME Has Available for You Colanders in a Variety of Styles and Colors. These Colanders Sit securely on pots and pans. You could just drain, strain and leave. Keep your hands free while you season, stir or get on with other things in your kitchen. Simply leave the strainer to rest on top of pots, pans or mixing bowls. The drainage holes are arranged in such a way that you can drain your pasta, veg or other foods in no time at all. The holes are large but not too big, so food won't slip through. We have these Colanders available in either 8.5 in. 9.75 in. 10 or 14 in. Perfect for feeding a large crowd. Fit a large portion of pasta, spaghetti or potatoes into it. Long handle ensures improved functionality. They are durable for Everyday Use. If you are a caterer, or parent of lots of children you will be using this strainer pretty much every day. It's tough, strong and durable, which will last you for years and years. The colanders may freak out some moms, but its BPA free, and made with acidic and alkali stain-resistant materials. You can choose from a circular colander or a square colander. The round shape is good for nesting inside your other pots or pans. While the square looks, cool and modern and can be hung up on a hook. YBM HOME COLANDERS ARE THE MOST DESIRABLE BECAUSE THEY HAVE LARGE HOLES FOR QUICK DRAINING WHEN HUNGRY PEOPLE ARE WAITING FOR THEIR SUPPER.